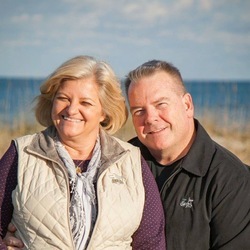 Pastor Hal began serving at FBC Carolina Beach in May of 2016. He is a graduate of Gardner-Webb University and Southwestern Baptist Theological Seminary. He met the love of his life, Sherrie in college and they have 3 daughters and 3 "Son-in-Loves" with 5 Grandchildren. Hal and Sherrie are native North Carolinians and have both served churches for 17 years in Texas, Florida and North Carolina. Hal has also served for another 17 years in Ministry with The Fellowship of Christian Athletes. 409 N. Lake Park Blvd.